The Washington Times Sealed Bonnet Contest of 1907 | Park View, D.C.
One of 16 commemorative loving cups awarded to drivers who completed the 1908 Washington Times Sealed Bonnet Contest. Georgia Avenue has played many roles since its creation in 1810. One of its more important functions has been as a gateway into and out of Washington for commerce and transportation. 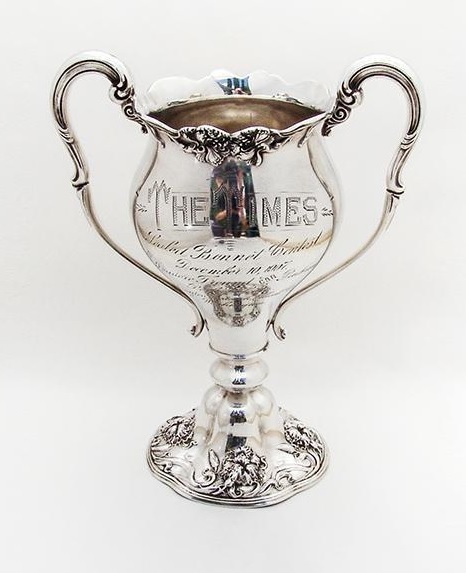 So when I found a loving cup that commemorated an early automobile endurance test and was able to fix part of the route as being on Georgia Avenue, I was eager to learn more about the event. One of the things I was able to learn was that the trophy was originally one of sixteen such cups that were created for each of those who completed the course in the time allowed. As the goal of an endurance test is to complete the test, there were no official “winners” of the event, merely those who finished and those that did not. 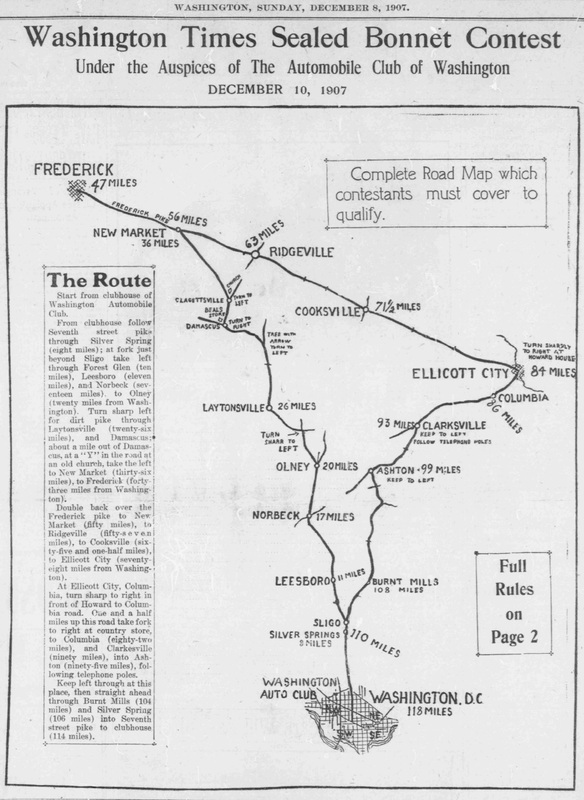 The inscription provides plenty of clues to help track down the story behind the contest — including that it was sponsored by the Washington Times newspaper, that is was a “Sealed Bonnet Contest”, and that the route was from Washington, D.C., to Frederick, Md., to Ellicott City, MD, and back to Washington. Sealed Bonnet contests were automobile endurance contests that were intended to draw the public’s attention to the durability and reliability of automobiles. They were called “Sealed Bonnet” contests because seals were placed on mechanical parts and the hood (bonnet) of the car to prove that no mechanical repairs had been made during the contest. 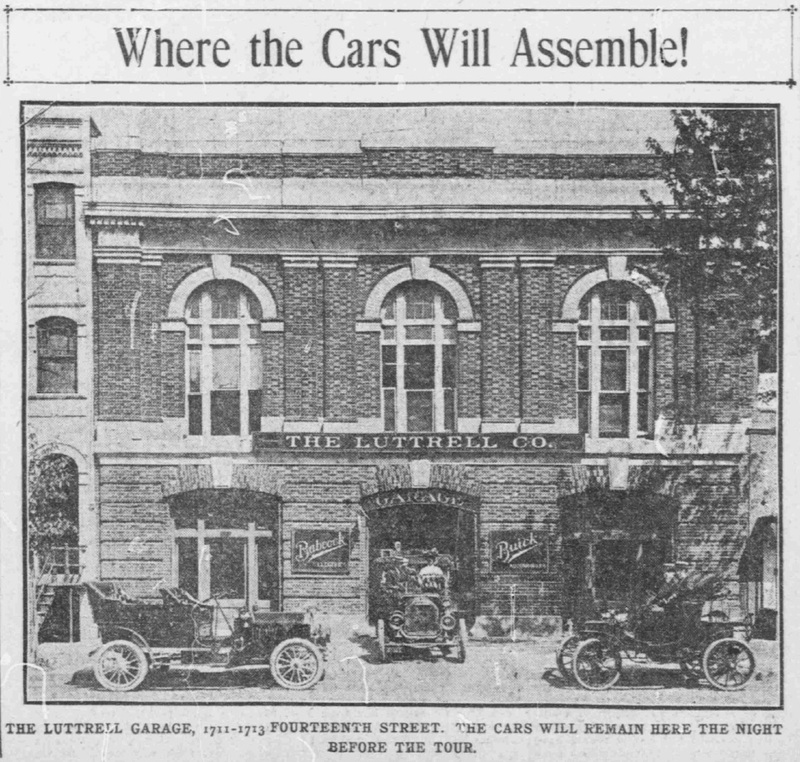 While the Washington Times contest was not the first such event in the nation (I know of one that was held in New York on May 4, 1907, and I’m sure there were others), it was the earliest such contest organized in Washington, D.C.
Luttrell Garage on 14th Street, where cars were inspected in preparation for the contest. As suggested by the cup’s inscription, the contest began in Washington. Specifically, the event began at the Luttrell Garage located at 1711-1713 14th Street, NW, where drivers had their cars inspected and sealed the day before the contest, December 9th. The building which once housed Luttrell Garage still stands today. From Luttrell Garage, the route followed the Seventh Street Pike (Georgia Avenue) north through Silver Spring, Leesboro, Norbeck, and Olney. Here it turned and went through Laytonsville and Damascus on its way to Frederick. Once at Frederick cars turned around and traveled to Ellicott City through New Market, where again cars changed course and headed back toward Silver Spring where they could pick up the Seventh Street Pike and return to the garage on 14th Street. The map below roughly shows the entire 118 mile course. Weather played its part to make the contest more difficult than expected. Drivers began the contest at 8 a.m. From Washington to Olney they encountered a driving rain. Upon reaching Olney and turning toward Laytonsville, the drivers encountered what was described as a sea of mud. Twenty five of the twenty six drivers successfully navigated the muddy conditions. While a few drivers were able to pull through the mud without stopping, every driver encountered difficulty as the mud came up to the bodies of the cars. The rain continued nearly until reaching Frederick, where it began to break. By the time drivers neared Ellicott City they encountered clear skies with a bright moon. Upon leaving Ellicott City, drivers were again confronted by bad weather, this time by a squall of snow, hail, and rain. Twenty six drivers had entered the contest. Remarkably sixteen completed the course without mechanical problems and within the time permitted. Each of these would receive a silver loving cup trophy commemorating their accomplishment. Four cars did not finish due to mechanical failures that included a broken cylinder, a broken spark plug, and a broken axle. Six drivers were disqualified. The contest captured the imagination of Washingtonians and helped popularized automobiles in the District of Columbia. One result was that automobile dealers reported an unexpected increase in the sales of all types of cars following the event. Capitalizing on their success, the Washington Times held a second Sealed Bonnet Contest on June 9, 1908, which was sanctioned by the American Automobile Association and received wider interest that the 1906 event — including drivers from Baltimore and Philadelphia. This entry was posted on March 16, 2017 at 7:01 am and is filed under History. You can subscribe via RSS 2.0 feed to this post's comments. Very cool. It is hard to imagine that driving 118 miles was a big deal back then. My father usedto own a Model A and told me the stories of the broken wooden wheel spokes. Great site and great information. 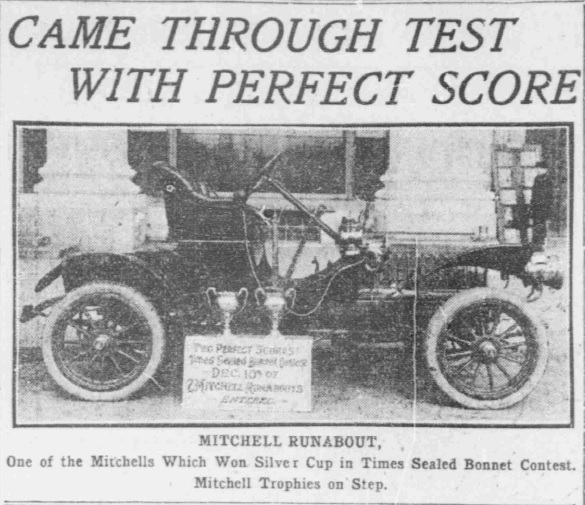 I have another trophy from the 1907 race won by M. G. Harrison driving a Corbin. It is very similar to the one you have pictured. Will probably be listing it on the net at some point. Thanks again for a great site.